Why do you wear lipstick? To enhance your lip color? To give them a more defined shape? To make them look more youthful, healthier or fuller? Eye Design’s semi-permanent lip makeup can do all of that and more! Out of all the makeup women wear regularly, lipstick is arguably the biggest hassle. It requires the most reapplications, plus it smudges and even gets stuck on your teeth--yuck! Let our skilled technicians help you ditch it for good. Our studio offers semi-permanent lip makeup in a variety of natural colors. We have two options: Defined Outline or Soft Outline. In either case the client can choose which technique she prefers, as well as the pigment color or colors. We transform lackluster lips by correcting color or asymmetry while reducing the appearance of age lines. Additionally, our semi-permanent lip makeup gives you more definition and the appearance of more volume. Lip fillers require several touch-ups a year, and they do nothing to liven up the lips’ natural color. 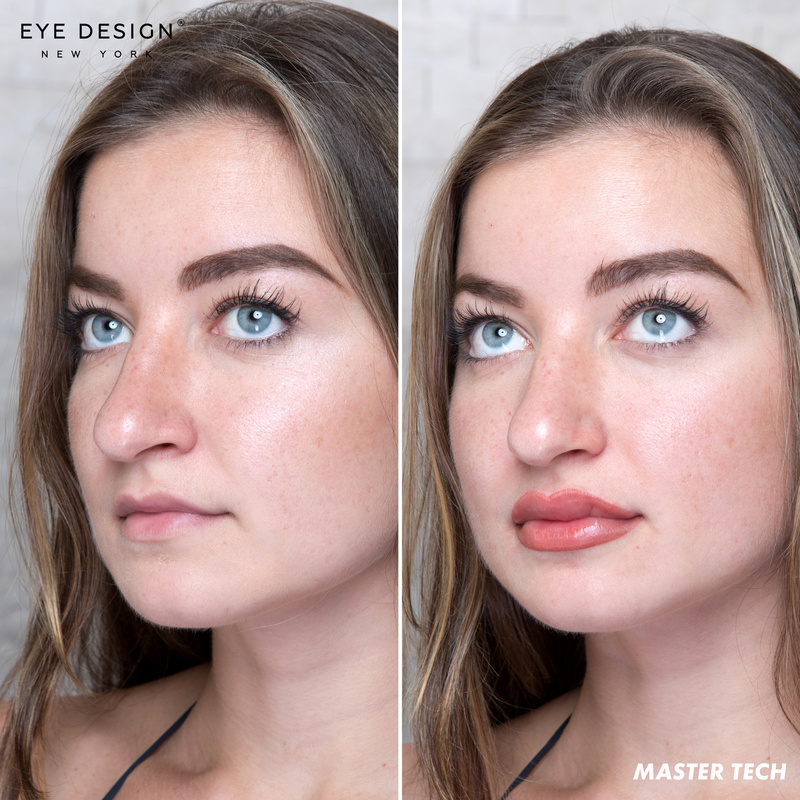 Eye Design’s semi-permanent makeup, on the other hand, gives lips a fuller appearance, as well as beautiful, natural- and healthy-looking pigment--completely eliminating the need for lipstick! Downtime and aftercare is minimal. The lips will be tender for 24 hours and they may be some minor swelling. Do not use lipstick lip gloss or any other makeup on your lips during these 24 hours. You should not have any other cosmetic procedure (such as chemical peels, botox or any type of lifting), and avoid spicy, sour, salty or hot foods. These foods can be painful and cause unpleasant sensations like burning. In the 24 hours following your treatment, do not visit saunas, swimming pools or baths; refrain from indoor tanning, as well as sunbathing. Do not wipe your lips with wet napkins, and never pick or peel off the scabs yourself. After 24 hours you should apply sunscreen regularly to the treated area to avoid premature fading. Most clients choose to do a touch-up around the 1-year mark. Lips lose their natural outline with age. Eye Design’s technicians can restore lips’ youthful appearance by adding darker pigment along the outline to create definition. A lighter pigment will be applied to the center of the lips. This option is recommended for mature clients. For clients with little definition, Eye Design can add color to the lips with a blurred outline effect. This option also involves adding a lighter color to the center, and is recommended for younger clients. 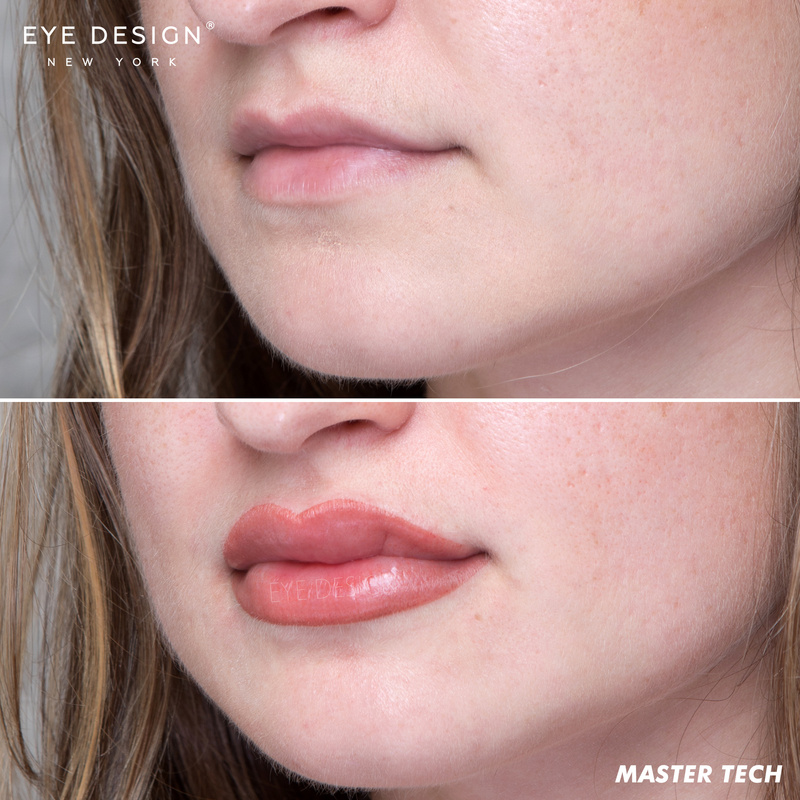 This technique creates the most natural-looking lips, and oftentimes, the color matches a natural lip color that is appropriate for the client’s skin tone and undertones.